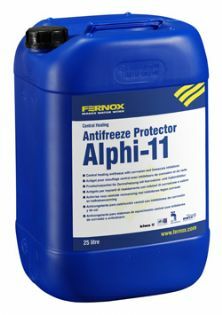 When you need an inhibitor that also acts, as an effective antifreeze the solution remains same - it's just the name that's changed - with the re-branding of Fernox, Alphi-11 to Antifreeze Protector Alphi-11. The high performance product protects against internal corrosion and limescale formation and eliminates the risk of freezing - down to temperatures of -22Â°. Available in 5 and 10 litre packs, Antifreeze Alphi-11 is the ideal product to protect pipework from freezing temperatures as, like last year, the winter starts to bite in the New Year. The product's unique properties prevent corrosion of all metals found in domestic central heating systems, i.e. ferrous metals, copper and copper alloys and aluminium. Fernox Antifreeze Protector Alphi-11 can be used alongside any circulating pump and can be introduced via the feed and expansion tank or injected directly into the system. The non-toxic, environmentally friendly, clear liquid is EDTA, nitrate and phosphate-free and is accredited with KIWA, Belgaqua, BuildCert and DWTA approvals. The minimum recommended 'in-use' concentration of Antifreeze Protector Alphi-11 is 25%, which can ensure a system is protected down to -11Â°. However, a concentration of 40% can achieve protection levels down to temperatures as far as -22Â°. For continued protection Fernox recommends protector levels are checked annually. All Fernox products are simple to use and are guaranteed to work effectively. As a consequence they boost efficiency, play a major part in reducing time spent on-site and help avoid costly call-backs.